Title: Spin-orbit Coupling in Photonic Systems: from Optical Spin Hall Effect to Z Topological Insulator Analog. Speaker: Guillaume Malpuech, Institut Pascal, CNRS and University Blaise Pascal, France. The optical modes of photonic structures are the so-called TE and TM modes which bring intrinsic spin-orbit coupling and chirality to these systems. 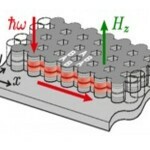 This, combined with the unique flexibility of design of the photonic potential, and the mixing with excitonic resonances, allows to achieve many phenomena, often analogous to other solid state systems. In this contribution, I will review several of these realizations, namely the optical spin Hall effect , Berry curvature for photons , and the photonic/polaritonic topological insulator [3,4]. A.V. Kavokin, G. Malpuech, and M.M. Glazov, Phys. Rev. Lett. 95, 136601 (2005). I. A. Shelykh, G. Pavlovic, D. D. Solnyshkov, and G. Malpuech Phys. Rev. Lett. 102, 046407 (2009). F.D.M. Haldane and S. Raghu, Phys. Rev. Lett. 100, 013904, (2008). A. Nalitov, D.D. Solnyshkov, G. Malpuech, Phys. Rev. Lett. 114, 116401, (2015).